During the Summer months, my candles have been put to the side but now that it's starting to get a little more chilly, it's time to bring out the old favourites and throw a new one into the mix. Armed with £5 in Space NK points, plus an additional £10 they loaded onto my loyalty card for the Autumn season (seriously, how amazing is that?? 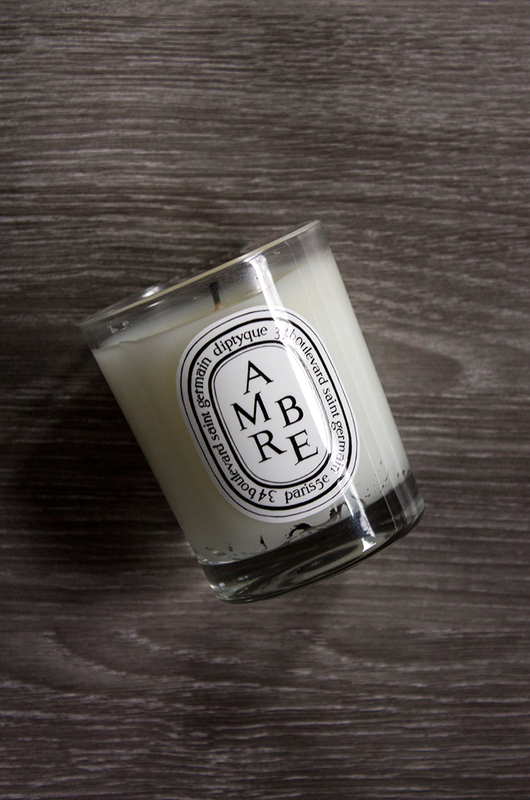 ), I thought it was about time I picked up the Diptyque Ambre Candle. If you want scents which are unique, good quality then Diptyque is definitely a brand to check out. Though if you've experienced them before, they are pretty pricey. Normally I'd suggest smelling the scent first but I bought Ambre blind without any experience of it before. However it was a safe choice for me as amber is one of my all time favourite scents so I was 99% sure I'd love it. Compared to other amber candles I've tried before, this one still has the sort of woody, fiery scent you'd expect but it's a little bit more on the creamy, fresh side like you'd expect with a vanilla scent. I do like this aspect because I feel it gives a cosy, homely feel so it's not too overpowering. Quality wise, despite it's small size this candle throws its scent really well. I can smell it as soon as it's lit from the other side of the room which not many candles of it's size can do. Overall, I think it may be a contender for my favourite Diptyque candle so far. If you're looking for something autumnal and want to treat yourself, it's definitely worth it.